← Life’s too short to be unhappy. Bullying: my thoughts on how to reduce it! Some would say my son is a bully. While I love my son, it’s true that there have been times when he engaged in bully behavior. But I think the reason is quite simple: misery loves company. Children who feel bad about themselves want to make others feel the same way, worse even. My son was feeling insecure about his abilities and relationships. I’m not making excuses, but children communicate with us through their behavior. Now the root of this problem goes so much deeper than I’d like to get into today. But one piece of this puzzle is lack of outdoor, unsupervised play (yes, I’m guilty of hovering in his early years). I’m not necessarily talking about sending toddlers out the door with a wave goodbye, but do you remember when you were a kid? Your parents would send you out to play early on a Saturday morning and not call you back in until dark. You would spend all day climbing trees, building forts with the neighbors, or rearranging stones in a stream so you and your friends could create a pool. We weren’t just playing, we were learning crucial social skills. We had to learn to get along with whoever was available, all ages, personalities, and cultures (depending where you live…not much culture where I grew up). Children had to be members of a team to accomplish a task, often a fort, which requires thinking outside the box, patience, and compromise. And remember how excited you were when you finally dragged your parents outside late that night and showed them what you and the neighbors did? I do. 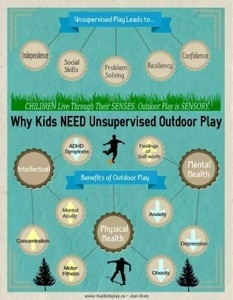 And let’s keep in mind the benefits of being in the natural environment. 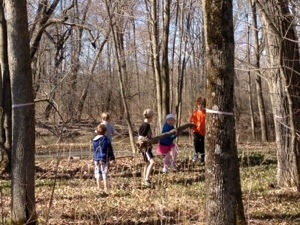 Children are more relaxed in the woods, with fewer conflicts and more collaboration. Fresh air and a variety of sensory stimuli make for a terrific night sleep too.